At the start of the year we bought English Heritage Annual Passes, we've done it before and had a blast going around all the local castles and old buildings and now LP is older we decided to do it again. 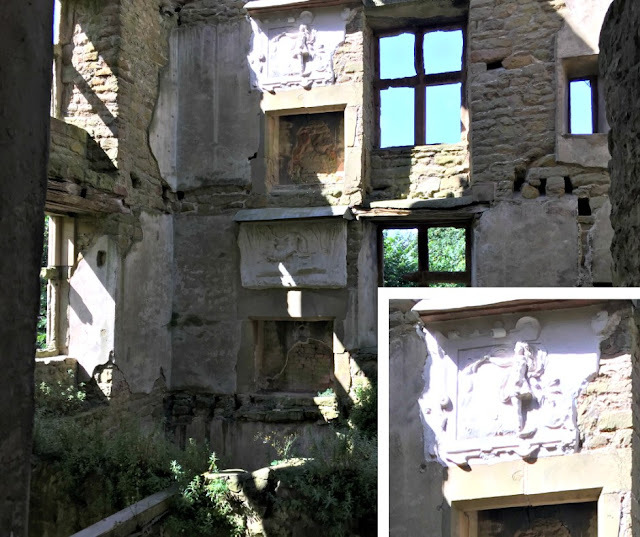 We'd been to Hardwick Old Hall before and had a wander around the building but we'd never done the audio tour. As it was the holidays we decided to try out the audio tour and not only did we learn a lot but the boys enjoyed it! As you walk towards Hardwick Old Hall you can't help but note how big the place is. The many windows, much larger than today's, fill each side of the building allowing as much daylight into the building as possible. With the audio tour playing we walked to our first stopping point. 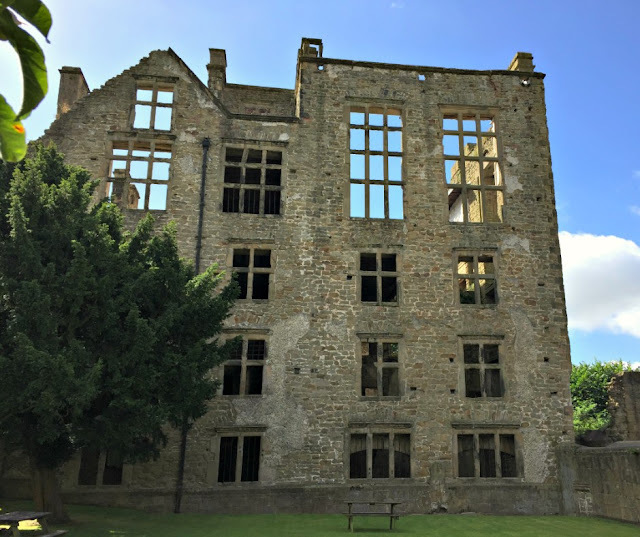 This is where we learnt a little about Bess of Hardwick, she rebuilt the Old Hall in 1587 to make it suitable for her wealth and social position at the time. She was well known and interested in architecture, she used an Italian architecture book as inspiration when she was building. The beginning of the tour led us into what would've been the Great Hall, a place servants would've eaten their meals. 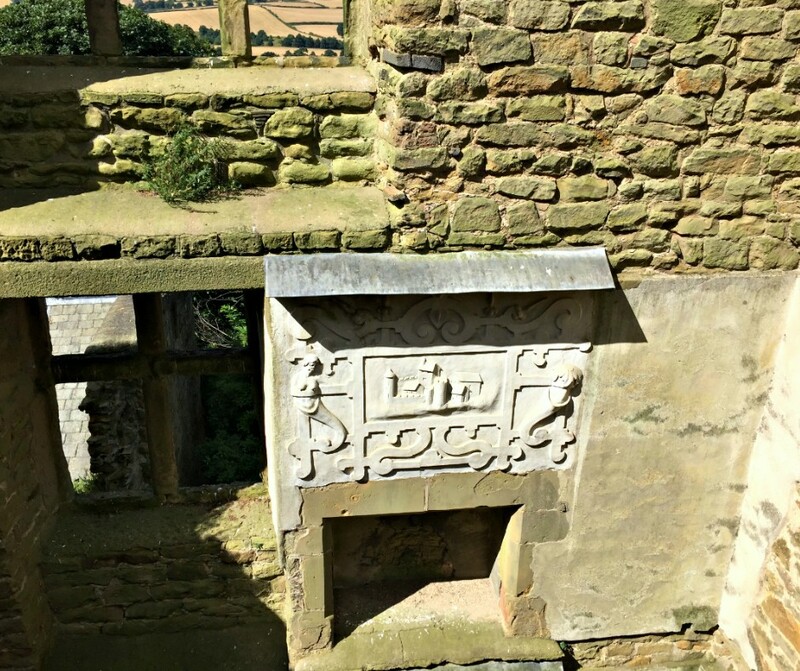 There was a large fireplace with a plasterwork overmantel which showed symbols of Bess's family. 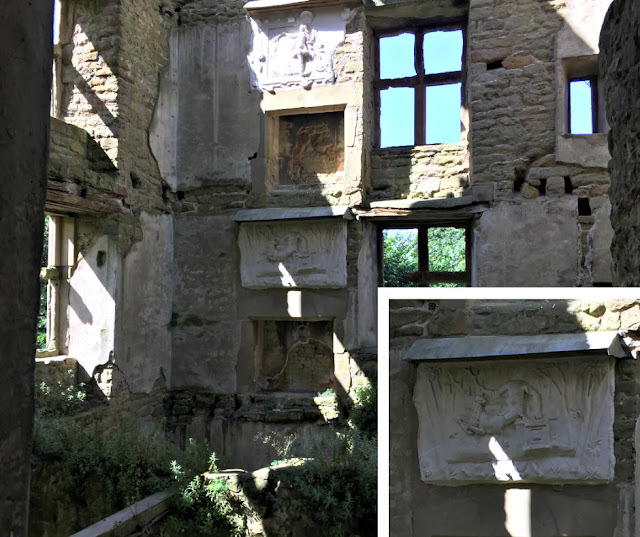 The stag was the symbol for the Cavendish family and it features in most of the plasterwork in the building. 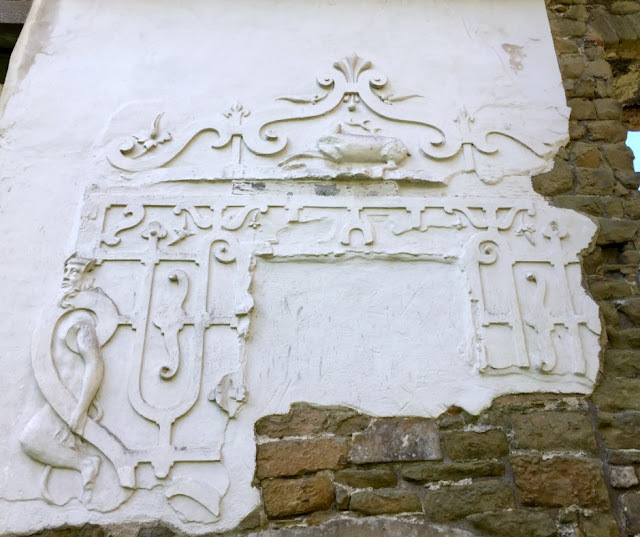 This plasterwork was above a fireplace in the dining room for the servants. The more important the servant, the closer he/she got to sit to the fire! Standing in front of the area the stairs would've been was interesting, as you look up at the wall you can see the ridges where the stairs met the wall. It is still possible to see the beginnings of the staircase and as I stood there looking at it I imagined what it would've been like. 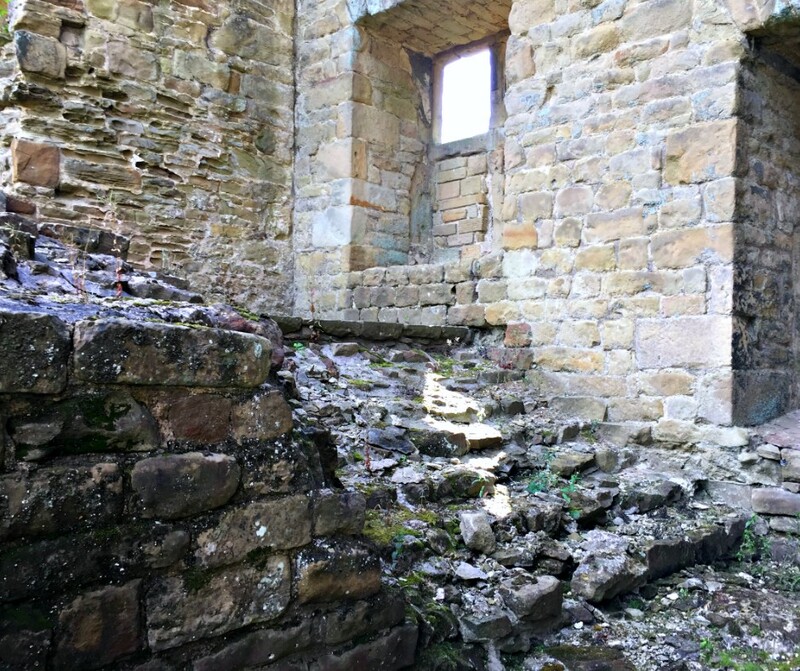 The servants would've used this staircase to take food to the top floors where Bess and her family resided. The staircase was so large that by the time the servants reached the top floor the food would've been cold. 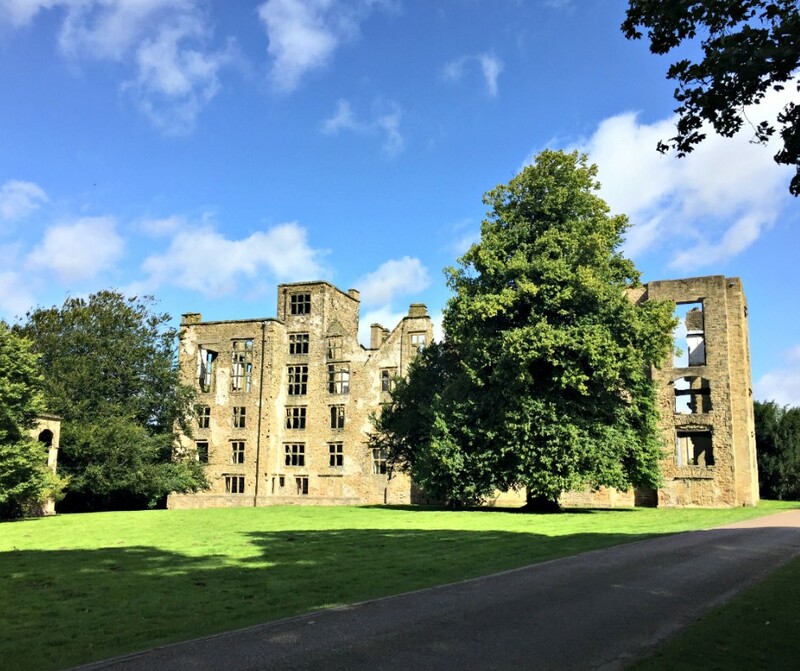 The Forest Great Chamber was a reception room on the top floor, it was used by Bess to receive her guests while surrounded by ladies in waiting. 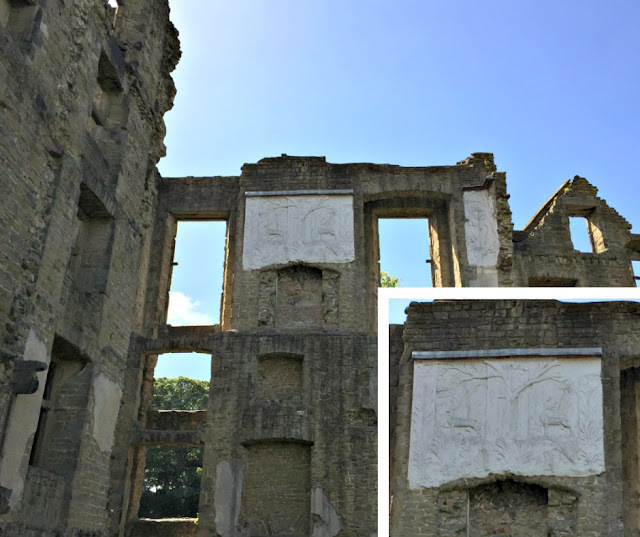 The walls were covered with plasterwork of the forest and stags. As we listened to the audio tour there was mention of chairs, at the time of Bess chairs were still very new and only very rich people would have them. 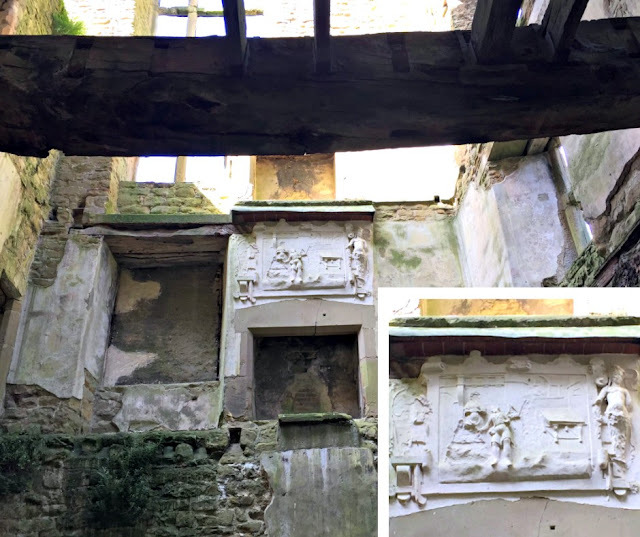 As I gazed up at the plasterwork on the ruin the Hubby and I discussed what it might have looked like when it was new. It must've been quite a sight. As this was high up it was difficult to get a good photo - but it's definitely worth a look! 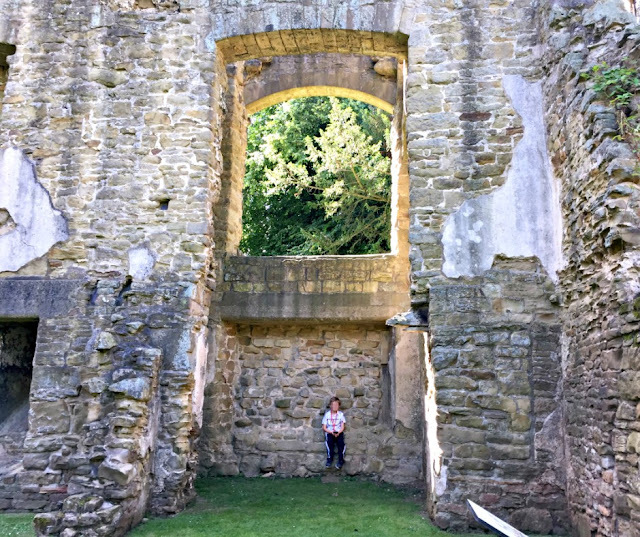 In the photo below you can see how large the windows were in Hardwick Old Hall, LP is looking rather small beneath a huge window. 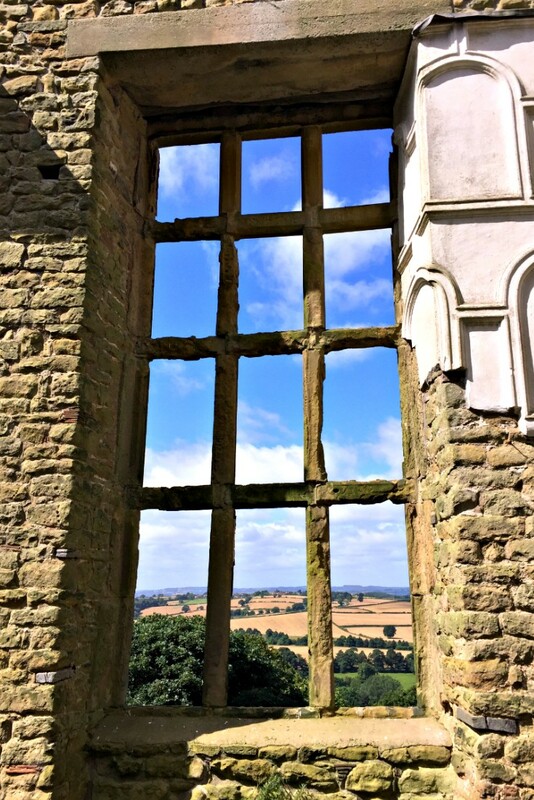 This window was upstairs and shows the views over the hills. Would the hills have looked like this in the 1500's/1600's? Whenever we walk around these old buildings there's often a mention of a Buttery and I always wondered what it was used for. 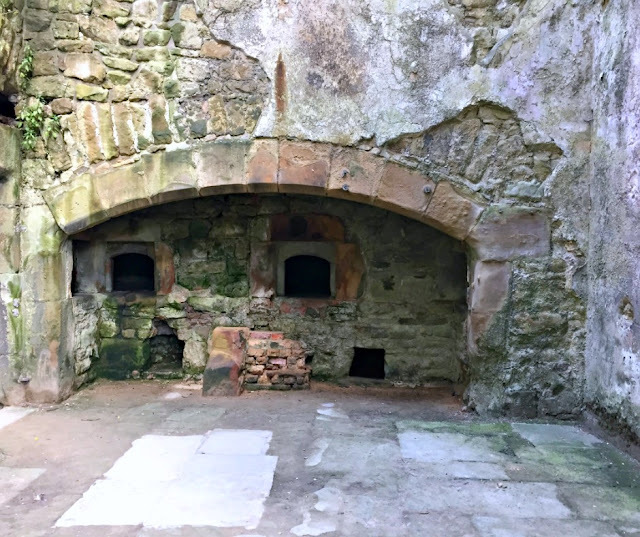 A Buttery is kind of a store room for the servants but it would've been controlled, or watched over, by the head butler to make sure that other servants didn't take more than their share of beer or bread. Hardwick Old Hall isn't just a ruin, there are stairs to climb where you can see the plasterwork overmantels that would've been in the bedrooms and reception rooms on the top floor. We listened to the audio tour and it instructed us where and when to go and told stories about Bess and her rooms. 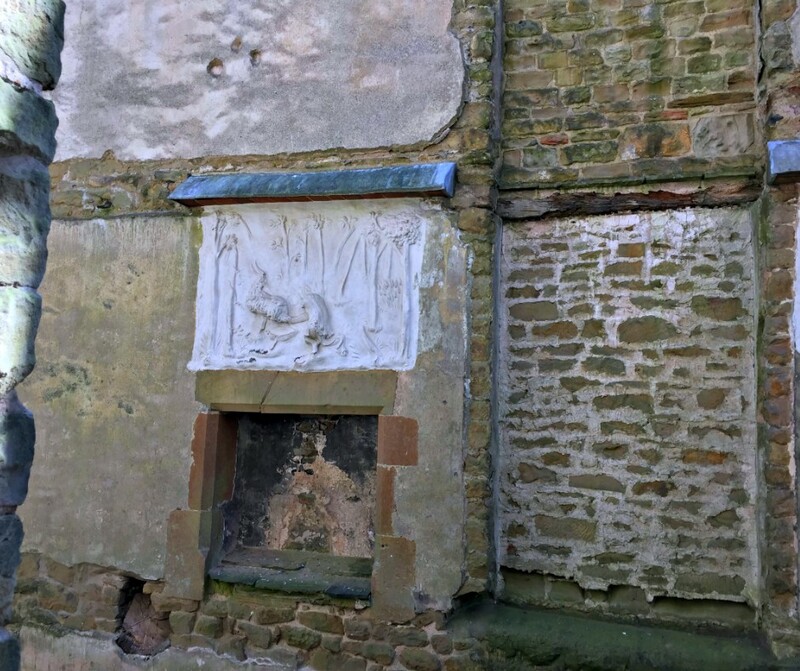 In this plasterwork it looks like a man is helping a stag. From the top floor of Hardwick Old Hall there's a spot where you get a great view of the newer building. What struck me most about this building was that Bess had her initials on every single tower of that building, facing outwards, so no matter where you came from you could see her initials. We didn't go inside the newer building on this visit but we will on a future visit. Visiting Hardwick Old Hall is one of my favourite things we did over the summer. 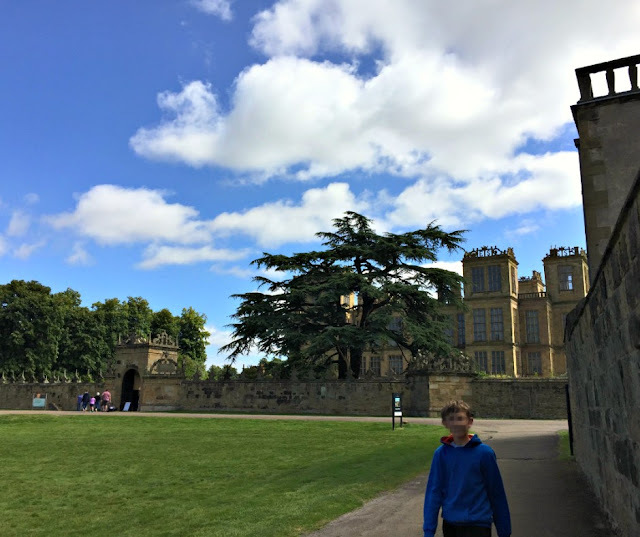 I got to listen to stories about Bess of Hardwick, I got to learn a little history, and I got to walk around an old building imagining what it was once like. The boys enjoyed listening to the audio tour and have said they want to revisit Bolsover Castle so we can take the audio tour. 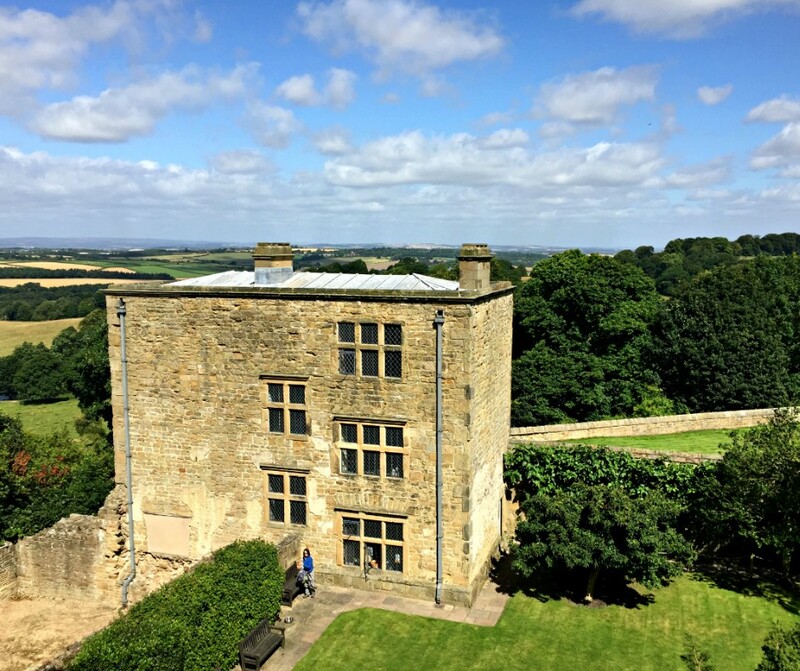 This gorgeous view can be seen from upstairs in the Old Hall. 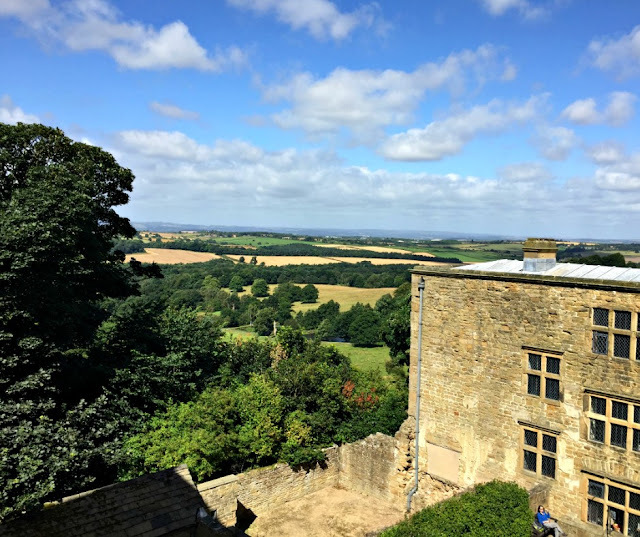 Apparently to the right you could once see Bolsover Castle in the distance. 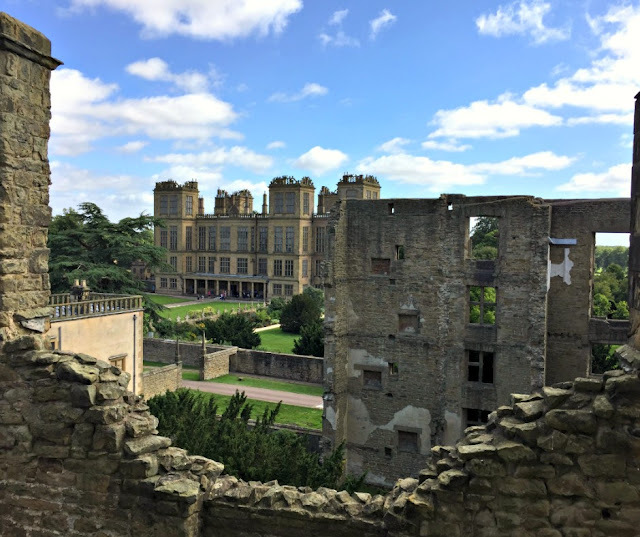 English Heritage have done a fantastic job at Hardwick Old Hall, the audio tour transforms your visit from a simple trip to an old building into a tour through an amazing historical home hearing stories about the people who lived there. It was like being a fly on the wall. 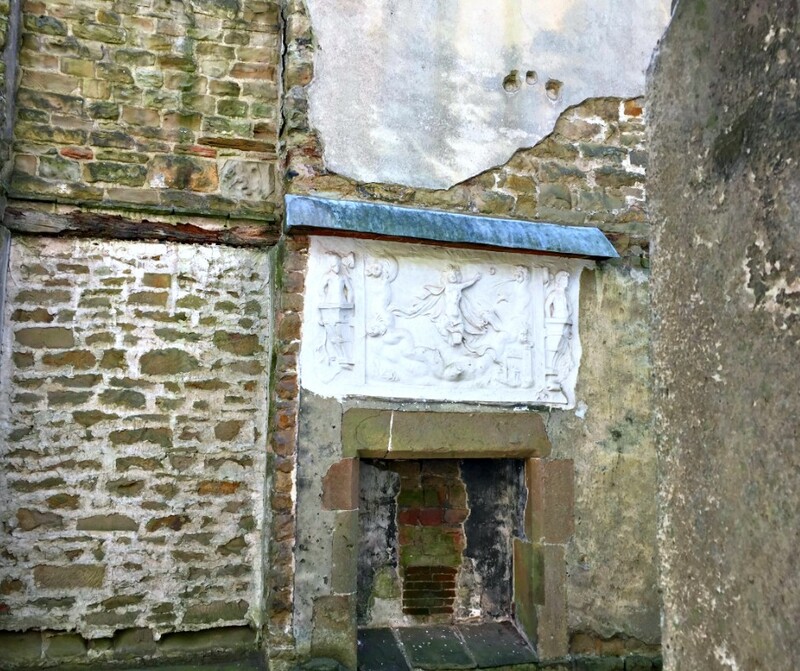 After the success of our visit we'll be more inclined to do audio tours in the future. I was NOT paid to write this post, nor was it a review. 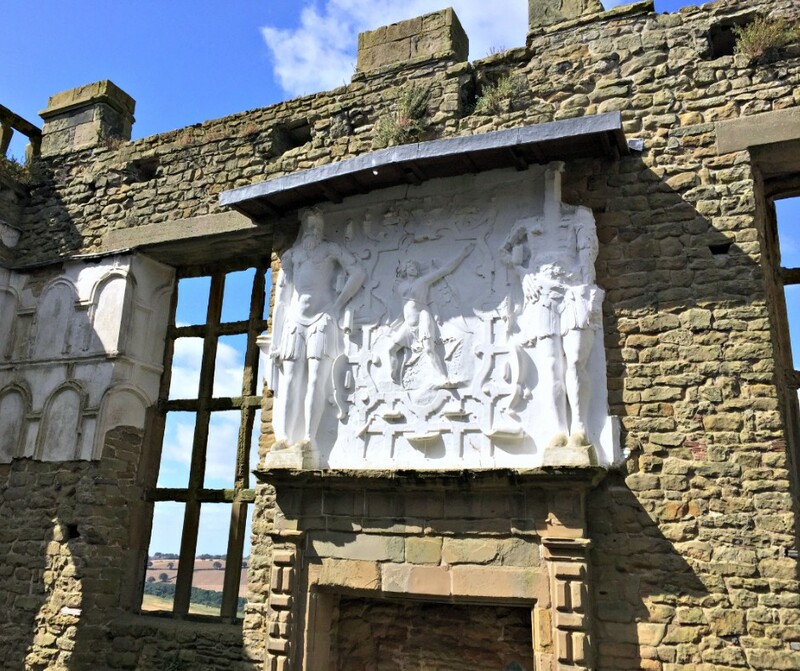 We paid for our English Heritage membership ourselves and we loved it so much I wanted to share this review. This has bought back memories of when we visited. It's a lovely day out. The new Hall is great too, well worth a visit.